Restore The Function and Look Of Your Smile! Missing a tooth or several teeth? We can help you restore the beauty and function of your smile with dental implants. Unlike filings or crowns that are bonded to the tooth, dental implants are surgically implanted into the jawbone below the gum line. After the implant is surgically placed in the bone and allowed to heal, an artificial, natural-looking tooth is attached to it. Dental implants are extremely popular choices for people who have lost a tooth, or multiple teeth, due to periodontal disease, injury, or a medical condition. A dental implant is a replacement for your tooth’s roots and is anchored to your jaw bone. 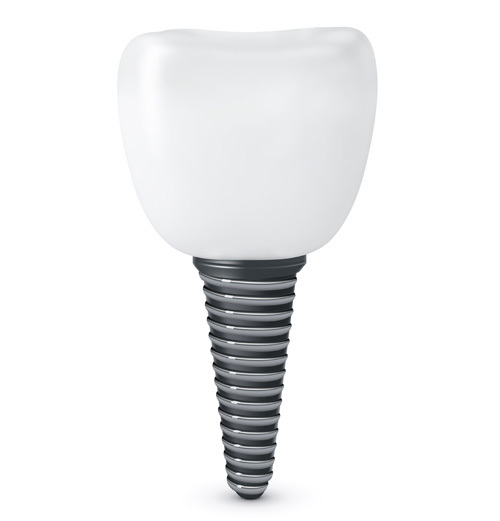 Once put into place, these implants enable the dentist to attach a crown (cap), denture, or bridge to them. These are designed to be long lasting and with care can last for many years. They are not your teeth but can function just like them. Patients who have dentures sometimes find that denture adhesives are unreliable and messy. Implant-supported dentures are meant to provide a more stable support for your dentures. This procedure eliminates problems such as shifting and will provide you with a more comfortable fit, enhancing your ability to chew and speak. Dental implants are changing the way people live! With them, people are rediscovering the comfort and confidence to eat, speak, laugh and enjoy life. Dr. Trevor Muntwyler has over twenty years experience restoring dental implants and has taken extensive training on the surgical and restorative aspects of treatment. By performing both the surgical placement as well as the final restoration procedures Dr. Trevor Muntwyler’s patients are conveniently treated from start to finish in our office. Call our dental office today to learn more about your choices to replace missing teeth with dental implants or to schedule your smile consultation.